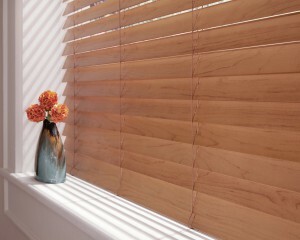 Here in Florida, the high humidity can really reduce the beauty and durability of real wood blinds. At Treasure Coast Window Fashions serving the West Palm Beach area, we offer a variety of faux wood blinds as a great alternative. With the look of real wood and the durability of man-made materials, EverWood® faux wood blinds can cover any window with long-lasting style. DISTINCTIONS™ – A new designation given to the palette of our best-selling white finishes. TRUGRAIN® – this proprietary finish mirrors the organic feeling and realistic depth of natural materials, creating a look of warmth and beauty. RENDITIONS™ – Available in a variety of whites and four new finishes that mimic wood grain effects. Heat shield advantage resists warping and bowing due to excessive heat. Ultraviolet advantage will not fade or yellow from the sun’s damaging rays. Proprietary finishing techniques designed and engineered to enhance appearance. Designed and custom-assembled in the United States, Hunter Douglas faux wood blinds are backed by a lifetime guarantee. LiteRise® cordless lifting system – Eliminates lift cords, enhancing child safety. for large or hard-to-reach blinds. EPIC™ – The standard for all EverWood® Collection blinds, the EPIC cordlock system provides a time-tested, quiet and reliable lifting option. For even more assurance, you can feel good about Performance Plus™ Protection. The EverWood Collection is the only brand of alternative wood blinds to protect against fading, yellowing, warping or bowing. EverWood faux wood blinds are also GREENGUARD Indoor Air Quality Certified to ensure better indoor air quality in your home.